Hi Adrian, can you tell us a bit about the services you are offering? I provide a handyman service for general repairs and maintenance of all kinds around the home and garden mainly for vulnerable adults in our community such as older people, people with learning difficulties, people with physical or sensory impairments and people with mental health problems. The whole idea is to help those people improve their way of life and become a bit more independent when they are at home. 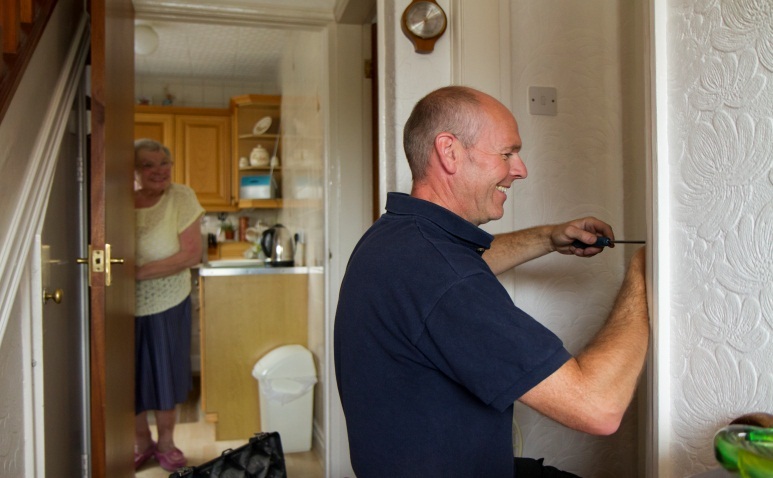 How did the idea of setting up a handyman service for vulnerable people start? I knew there was demand for these services through research, but also from work carried out with local Neighbourhood Network Schemes, who were very interested in a local, trustworthy, affordable and reliable handyman service which is provided by a person known to them and their members. It’s not surprising either – there’s a lot of, shall we say, ‘unqualified’ people out there who are all a little bit too keen to do jobs they’re simply not trained for. It can be expensive too as the jobs aren’t always done right the first time. Many older people had voiced concerns that they don’t like strangers in their homes but they do want work carried out that will make their home a secure and safe place to be and a home that they can still take pride in. This helps them to remain independent, giving them choice and control of where they live. I offer a broad range of skills and can meet the needs of the customers by providing a one company solution. Customers told us that they didn’t like having lots of different trades people in their homes for different types of jobs and other than Care and Repair, I am not aware of any other Social Enterprise company offering such a bespoke service. Opportunity knocked! What are your key objectives in providing such a service? My main objective is to help people stay independent in their home and to help customers have a feeling of wellbeing and security. It’s also about people being able to feel house proud; by using my knowledge and experience in the work that I’m offering, I believe this can be achieved. I also aim to increase the number of vulnerable adults I serve year on year making my company sustainable as well as enabling my customers to be more independent and increase their level of comfort and security in their own homes. My volunteering work with a local Neighbourhood Network scheme gives me a greater understanding of my market place and the needs of my customers and being able to carry out handyman tasks can make a massive difference to people’s lives. Please tell us about specific things you do to promote your business? I continue to market my services via the Leeds Directory, and I’m pleased to say I hold a green tick for quality assurance. With my current client base increasing and their positive feedback, I aim to be at the top of the Leeds Directory’s service list! I also supply flyers and business cards to local Neighbourhood Network schemes and work in partnership with other relevant voluntary and community groups for vulnerable adults and their members. I am already receiving very positive comments which I aim to build on as it is statistically proven to generate repeat business and new business via word of mouth. I think this is one of the strongest ways to promote what you do – independent testimonials. It’s one thing knowing I’m good at what I do (that’s modesty for you! ), but when other people support that, it’s a far stronger message. I was once told that ‘you’re only as good as your last job’ and I really think it’s true. How do you know your business is having a positive social impact? Because the work is carried out directly for this group of people, I know I’m having a positive impact because of my customer’s increased level of comfort. Knowing that the work I have carried out has helped them to live independently and securely in their own homes really brings such a personal satisfaction. When my work is completed I always give the customer a simple HSM specific feedback postcard for them to complete and record what a difference the job has made to them and this in turn shows that I have achieved a positive social impact. I am 52 just spent about 3hrs trying to find what I just read here. It’s what I want to do. It has brought tears to my eyes thank you.